Yesterday, we toured the Landis Valley Museum, a living history museum showcasing PA German rural life, which includes historic buildings, demonstrations, workshops, and collections of early farm, craft and household objects. German-speaking immigrants who settled in Pennsylvania in the 17th—19th centuries were self-sufficient tradesmen and farmers. We still see their influence today in Pennsylvania bank barns, so called because they were built into a bank or hillside that allowed wagons and large equipment to enter at the second floor. PA Germans designed the Pennsylvania long rifle and the Conestoga wagon, and brought with them craftmaking skills in redware (pottery), fraktur and scherenschnitt, and traditions that have become part of mainstream American culture—the Easter rabbit, decorated Easter egg, and Christmas tree. Although the museum is very interesting, my main purpose for the tour was to take a few photos of a particular piece of furniture. 130 photos later, I believe I can build a reasonable facsimile of this piece, even though I could only get as close to it as the wall of glass would allow. I hope the curator doesn't mind a few noseprints. 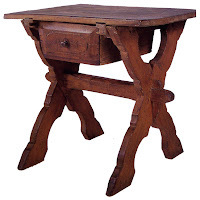 Believed to have been built in 1750, although the date 1805 is carved into the drawer front, this sawbuck table's distinctively German feature is a top that can be lifted off by removing dowels so that it could be used elsewhere as a work surface. What also attracted me to this piece are the tusk tenon joinery and the baroque style of the legs. In my shop, a huge plank of 12/4 cherry is anxiously waiting to be transformed into a little PA German sawbuck table. Sawbuck Table photo is from Pennsylvania German Arts, by Irwin Richman.